Fiat Chrysler Automobiles (FCA) is the latest auto maker to embrace Android Auto and Apple CarPlay connectivity. The 4th-generation Uconnect infotainment system is expected to arrive in vehicles this year and brings more responsive capacitive touchscreens to FCA vehicles, which include: Chrysler, Dodge, Fiat, Jeep, Maserati and RAM brands. FCA promises the next-generation Uconnect system will have faster boot-times, more processing power and a higher resolution display. The company hasn't announced which cars will receive the new Uconnect system yet, unfortunately. 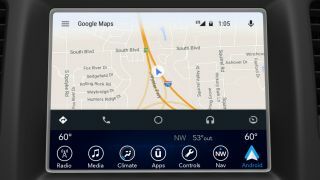 There are no plans to bring Android Auto and Apple CarPlay to vehicles with current generation Uconnect systems. The current Uconnect systems are available with different display sizes and aspect ratios. The more popular Uconnect Access 8.4 system with a 4:3 ratio display is available in Chrysler 200, 300, Jeep Cherokee, Grand Cherokee, Dodge Charger, Challenger, RAM trucks and Maserati Ghibli.